MECART works with noise issues of timber/ lumber mills in different ways. 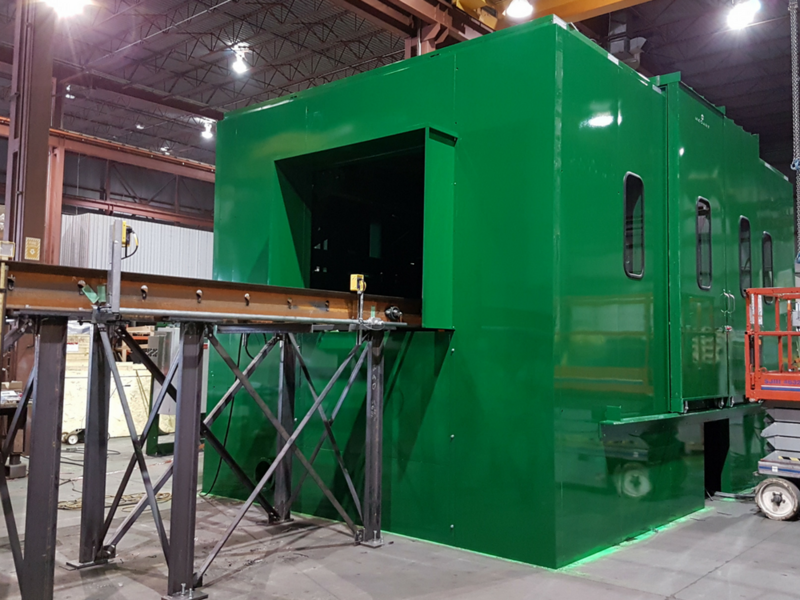 We can either design an operator booth or control room to isolate operators from the noise, vibration, heat and other hazards, or we can create a custom made sound enclosure for the machinery. We also work directly with original equipment manufacturers (OEM) by partnering with them to create a solution for their equipment issues. Lumber/timber mills and sawmills are very noisy and harsh environments where machine operators must be protected. NIOSH recommends a maximum noise exposure of 85 dBA per 8 hour shift. However, the actual noise level of typical woodworking machines is very often higher. Many of the tools required to cut or shape wood emit inherently high levels of noise in excess of 95 dBA at the operator’s location. Take the example of beam saws and sanding machines which produce approximately 97 dB(A) or that of double end tenoners 107 dB(A). In addition to the noise produced by the equipment and tools, the dusty environment of sawmills inevitably entails dust collectors, which create additional noise exposure for machine operators. Wood-cutting and shaping is the primary source of noise of woodworking machines and equipment. Noise is mainly produced by sawtooths, motors and compressed air. Most woodworking equipment use some type of enclosure to create a barrier between the noise source and operator. Engineering controls involve making physical modifications to control noise levels or to reduce exposure to noise. Made with acoustical panels, MECART modular buildings can reduce noise by 20 to 55 + decibels. In general, the term enclosure is used when it is the machinery or equipment that is enclosed in order to isolate the source, whereas the term control room or operator booth is used when the employees are the ones enclosed in an insulated room to protect them from the noise source. Hence, either option can be used in sawmills and timber/lumber mills, depending on the type of noise the mill is dealing with. There is an increasing demand for quieter machinery. More and more pressure is being put on original equipment manufacturers with an increasing number of sawmills and timber/lumber mills looking for a turnkey solution when purchasing a piece of equipment. OEMs are expected to supply equipment which include a solution that respects noise standards. OEMs can work with manufacturers such as MECART to integrate custom made sound control solutions as part of the equipment design and build process, either in the form of an enclosure or a protective workstation (soundproof cabin) for operators. The noise control solution can either be included in the equipment package, or presented as a discretionary option. Below are some projects completed by MECART for OEMs. A performant enclosure should reduce harmful noise levels without impeding workers’ production and efficiency. 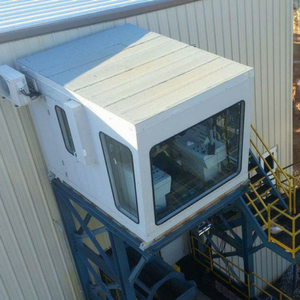 Enclosures and control rooms need to be well thought through for the operator to maintain visibility over the machinery and access when required. Access is a tricky part of the enclosure design for woodworking machines because any opening is a path for noise, especially if lacking proper insulation. MECART modular buildings are custom designed. 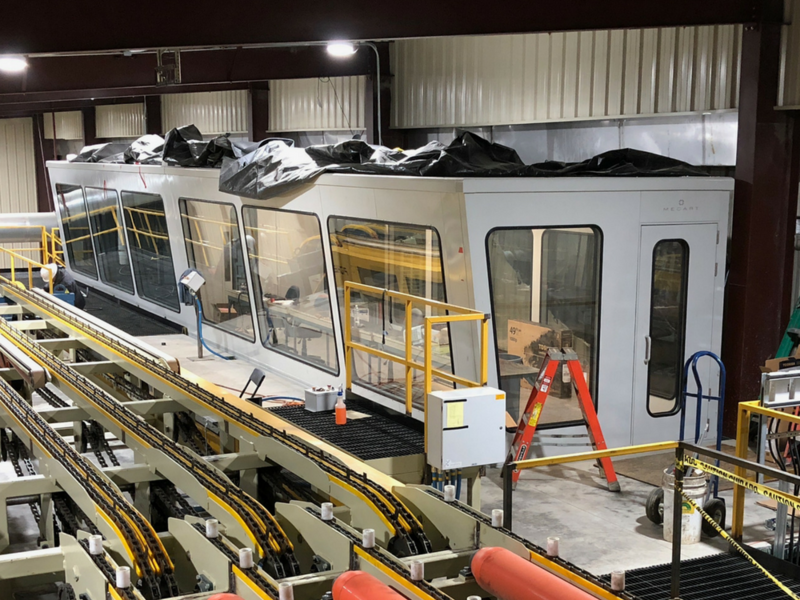 The enclosure can either closely fit the shape of your machinery or be large enough to let operators and maintenance workers access the equipment. Various visibility options: inclined windows, panoramic windows, etc. Entrance and exit tunnels that do not jeopardize soundproofing. Vibration damping system: a portion of noise is often generated through the machine structure by vibration.